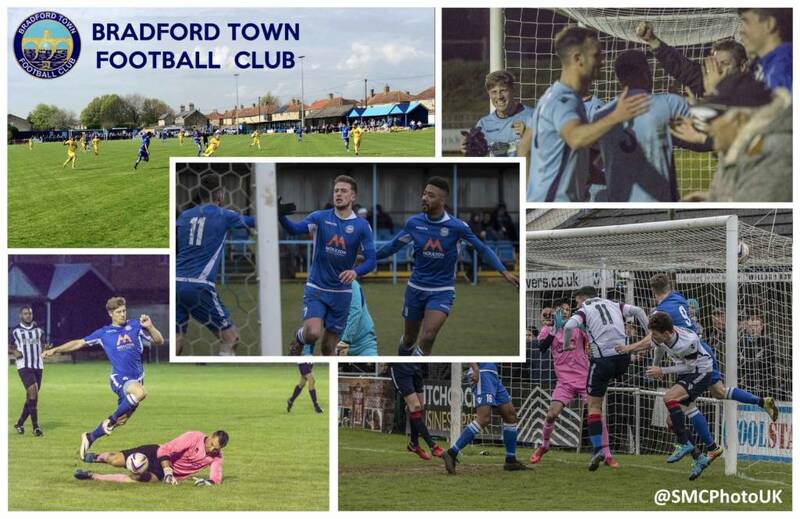 Bradford Town Football Club have recorded the most successful season in their history securing a fourth place finish in the Toolstation Western League Premier Division. Despite the disappointment suffered on the 28th April in Devon when Willand Rovers’ last minute winner finally dashed Town’s promotion aspirations for another season, manager Danny Greaves and his coaching staff have assembled an honest, hard working, skillful squad who fought a thoroughly entertaining campaign. Crowds have increased considerably on last year averaging 123 in all competitions with almost as many travelling across the Solent to see the team’s famous 1-0 FA Vase 4th Round victory over Newport Isle of Wight in January. Around a 100 of the Blue Army then flew the Bradford on Avon flag up to Redcar in the next round who despite seeing the side bow out of the competition 2-0 to Marske United, enjoyed a memorable weekend on Teesside. “With most of last year’s players already signed on for 2018-19, the team are targeting a top two finish for promotion to the Southern League which will require improvements to be made to our Trowbridge Road ground. For the available sponsorship opportunities and latest news please visit www.bradfordtownfc.com and if you are a football fan who fancies a good afternoon/evening out supporting the Town, you will be guaranteed a very warm welcome down at Trowbridge Road.